About the new area. It was kinda frsutrating to have a new place to unleash my level design creativity at such a late part of the game. By the time you reach this place, Samus is a walking tank, with a lot of health and all the abilities of the game. The only item that can limit the exploration is the Power Bomb, since it´s aqcuired there. But once you get them all the yellow hatches are accesible. The only other element I can play with is water. But i have to use water areas before the Gravity suit not so cramped or long, since water navigation is really slow and boring. I have a couple of sketches on paper, and I´m starting to make the rooms into the game. I might also start making the last area too, since it´s not so big after all. HyruleSwordsMan has all the final exams these weeks, so until his schedule is a little lighter I´ll be taking a break from the Zetas, and concentrate on level design. I want to thank everybody again for the comments and suggestions. I know I showed the Zetas early, but they will eventually be awesome thanks to your input. Do the zetas throw fireballs or acid? I always had the impression it was acid? Either way thanks for the update and I can't wait for the next. Great, keep up the good work! I want to see this out by 2011! Can't wait for the next demo! Keep up the great work! It sounds nice how much you have developed the game. I´m patiently waiting to the release. I have to say that I'm impressed, again. This is a lot of dedication on your part and it sounds like progress is going great. Hope to see the finished product eventually and hope that it's as great as the time and effort put into it should make it. Keep up the good work Doc. Alright DOC, thanks a lot for the updates. would it be too much to ask if you showed us a diagram of the whole map with all the completed area's highlighted with walls and doors? you provided that a long time ago at one point, i would love to see it again. also, i think acid would be better for the zeta's and not fire balls. fire balls were for ridley, let the metroids have acid. plus, the queen shoots out splotches of something that don't look like fire at all so it would make more sense if they didn't have fire balls at an earlier stage. Wow, awesome progress. I can't wait. Any chance of a super-tentative, absolutely-no-promises, possibly maybe could-be release date guesstimate? can some one please give me the link to where i can download it and what i need? It's coming along very well, and I would play, although they are close to completion. And finally, "The game also will be available in Spanish? and that American players would like it available in this language. For now, luck with the project and move on, and very little missing. So excited doc! Keep up the good work. I agree with the others that acid would be better than fire. Fire is kind of light-hearted (Mario, anyone? 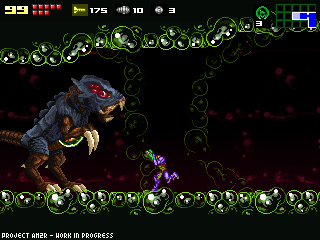 ), where as I've always seen Metroid 2 as creepy and ominous. Acid = Alien (the greatest movie ever). Hi Dr. M64, iwant to say you that i hear it a interesting music that you can give an idea for the intro of your Project AM2R, and its like the atmosphere of the Saga Metroid so please send me a mail for send it to you the music!! maybe you can take some rithm of the music!! please send me a answer if you accept to send it the mp3!! Looks like your almost done! The only things left really are the sprites, some enemy adjustments, a little more mapping, and a good bit of sound (ie music and FX). Keep up the good work and know that there are plenty of people around the world rooting you on this amazing project of yours! From what I have seen so far, this game may very be the best Metroid remake to date! Been following since the beginning and am amazed how dedicated you are. It looks like this project may even be done by the 3rd quarter of 2010! I hope some kind of chase sequence gets into the game. I can't overstate how much of an impact those made on my mentality in Fusion. Even one makes the rest of the game more intense. Better pants shitting scenes such as when Nightmare flew by in Fusion or when the "baby" metroid attacked in Super Metroid would also be great. These kind of mood setting things are really what make the game for me. I would also suggest that you should feel free to add your own new areas all over the place. Just put secret walls and things that can only be opened by power-ups you didn't get in the original. (E.G. Super Missiles or Power Bombs.) Basically that gives you freedom to add new areas wherever you want and still be cannon to the old game. Oh, and finally, I really hope that Power Bomsb work as they did in Fusion to reveal all special blocks within their blast radius. That's invaluable for exploration. So is X-ray visor. What do you think the dev team based it on? For Doc: I thought of a shinespark mechanic you could add as a late power-up that might help your problem. Don't know what you'd call it, but it would allow Samus to kick off walls while holding a speed boost charge. I'll leave your imagination to ponder that one. Doc I want you to know that THIS is the reason I check your blog daily! These are very nice details on the progress. And I've told you before, you need to get paid to do this stuff. If you haven't gone to school for this stuff, then you should so you can get some sort of certificate and get a job making $50k+ a year doing work like this. P.S. - I don't think downgrading Samus for a certain area would make any sense.. I noticed some people post about that. And as far as the game music, I like what you've been doing with that, so its all about keeping it so that it all fits together and fits the atmosphere at the same time. Remixes/updates to the original Metroid 2 soundtrack would be fine, seeing as we'd get to hear it CD quality sound instead of gameboy blips. Late game areas can still have obstacles for a late-game Samus. Spikes, acid, complicated morph ball puzzles, etc. One way to spice things up is to add some completely new enemies to your new area. Really tough ones. Not as tough as the advanced metroids, of course, but powerful and evasive enough to give a supermissile/plasmabeam armed Samus a tough time. To not make samus incredibly powerful in the end of the game, maybe a gamma metroid could steal one of her upgrades and fly away. and you follow the gamma metroid, but when you reach it, it evolves in to a Zeta metroid and you have to fight that one. Keep up the good work and please don't forget to also work on the classic GB graphic patch, since some of us can't stand the Zero Mission ones! And what about the progress of the Larva Metroids? Dr, I must simply bow. You have an excellent work here and I wait to see everything on its place soon. Surpise us! One comment though! Please, please don't forget that when reaching the Omega metroids' area, everything becomes much creepier (such as the music). You should also take notice that there are only a couple of species that exist here, the Goto and Ramulken. The powerful Metroids dominate over the lower creatures simply eating everything, so you feel a little bit stranded in these places. I think that a mini boss in the 'special' area should be non organic, maybe a robot? or chozo/torizo maybe? I like the idea of enemy's taking your items, and you having to chase them down. I think that would add to game play time, and give something else to do, than Just destroying Metroids. Will the other evolutions of Metroids have there own theme. You showed the Alpha's, and I think it's good, but it doesn't seem like it would fit the other Metroids. Maybe you already planned on doing this, I just thought I would put it out there just in case. If music is only at 30%, you can rectify that extremely quickly by seeking out some video game remix artists, I'm sure they would love to provide a track for this project. I am stupidly excited about this. Good to see the project so near completion! If you need creature ideas, don't forget that Fusion's fauna is taken from SR-388. As to the Queen, it will be interesting to see how you design it, and I would suggest looking to therizinosaur theropods for inspiration. Baixei o demo e adorei o jogo... está otimo mas versão final terá graficos melhores? Por exemplo vi que ao colocar em 1024 x 768 a imagem perdeu qualidade... e teria como os movimentos de andar da Samus ser mais suaves... mas femininos :D? Ah ia me esquecendo, esse metroid tera suporta a português? "Ah ia me esquecendo, esse metroid tera suporta a português?" Improvável, mas é Metroid, não precisa entender muita coisa. Also, for the secret area, you could use (someone already mentioned in older posts, probably)that acid that's in Zero Mission when you revisit Mother Brain's room. That can damage even the Gravity Suit, as you probably know. Just a suggestion. Good luck and take your time! heheikki said: "To not make samus incredibly powerful in the end of the game, maybe a gamma metroid could steal one of her upgrades and fly away. and you follow the gamma metroid, but when you reach it, it evolves in to a Zeta metroid and you have to fight that one." Metroids absorb life-force, not power-ups!That's what the Ing do! Deal with it people! scripted events that make you lose something you have already earned only work in rpg's, because they usually are improved once you earn them back. like in earthbound, you lose poo for a bit, but when he comes back he has a strong new magic attack. or in final fantasy 4, you constantly lose and gain back characters, but when you do they are leveled up and sometimes have better equipment. but if a metroid were to run off with your space jump, all you could do is kill it and take it back. nothing is gained. it would be like a like-like in zelda 64, except you have to wait half a dungeon to get your equipment back. it's just a time waster. better to go with spikes everywhere or acid-filled puzzles or something that adds actual difficulty. Amazing progress Doc!, and the zetas are amazing too! I have an idea for the metroid queen: how about an earthquake attack that causes crumbling rocks to fall everytime the queen moves or hits the ground with its tail? that could make the battle a bit difficult and fun, and maybe you could also make some "metroid reinforcement" (the queen calling metroid larvas)if it isn't too difficult to make, obviously. One question: it is possible that you put the "get eaten by the queen and bomb its stomach" battle technic to destroy the queen? or you have to destroy it with missiles? (I think you needed 100)because the battle will be very easy with the super missiles. Well, good luck with the project. You know, now that I think about it, I'm not bothered by the idea of losing some items that you'll regain once you fight the captor. If anything, just make her lose the gravity suit and get locked in an area you can't leave until you get it back. As one person suggested, have a Gamma steal the suit. The Gamma then immediately evolves into a Zeta. You begin to chase it, but the Gamma uses's the suit's gravity powers to trek through water faster than you can, and you're forced to follow it through a few of the water puzzles you intended to add to the area. Eventually, you find the Metroid and take it out, regaining your suit. Perhaps with the twist that the Metroids energize and enhance the suit's abilities once you retain them? Maybe the suit gains extra energy reserve tanks from the metroid toying with it? Nice, I cant wait until it is finished! I just released the first demo! for a greater challenge, Not provide any power-ups for destroying them, leaving samus with a large but diminishing supply of missiles and health, thus making the new area more of an endurance test now that samus is nearly unstoppable. Instead of regaining a stolen power-up or abilities (which wouldn't seem logical, just more cliche than anything else)... What about making the final boss so difficult that you have to have all your abilities and power-ups to even begin to have a chance? Also, decide if you want the area to be challenging to the fully powered samus or just a new area to go though. If you want it to be challenging for a fully powered samus, making her use all of her abilities, it should also be optional so that low % runs are possible. If you're asking for the Newest Tech Demo (Tech Demo 2) it is on the home page on the right side of the screen. Hey could you post mp3 downloads for finished music for the game. I know, I'm weird but please consider it. Any way very nice work so far. Keep it up. I second the comment someone else made about taking note of sector 1 in Fusion, where it was based off of SR-388. And speaking of Fusion, are you going to be using the Omega Metroid sprite from it? Can we have another tech demo thing please? Speaking of Sector 1, remember how there were those bubbly metroids in a couple places. I’m not positive whether they’re metroids or not, though, especially because they are infected by x. Here is a video. Look about 30 seconds into it to these mutated metroid things. Notice that as you destroy the smaller bubbles, they turn into bigger bubbles. I think there should be a metroid battle in the game involving these. You would keep destroying the bubbles, and they would keep turning into bigger metroid bubbles. Finally, they would combine to form a giant metroid bubble that you would have to fight as a boss battle. Killing it would then decrease your metroid meter by one. I know it’s just a suggestion, but that would be very neat. I also would like to see remixes of both of sector 1’s themes as music in your game. The first song is when you are destroying the atmospheric stabilizers, and the second song is when you are near Ridley X. I’m glad to see that this project is going so well! Hi! I´m really glad about the progress you have made so far. I have an idea but i don´t know if you already decided to implement it. The game could show some different pictures of samus at the end of the game according to the percentage of items you have collected or the time you needed to complete the game itself. I am very pleased to see the progress of this game! I am looking forward to playing it in the future! I have a suggestion about the new area. Your concern is that Samus is too powerful by the time she reaches it. Perhaps you could place the new area earlier in the game? Make it the place where she gets the gravity suit and power bombs (maybe that's what you had planned anyway), and have Samus have to either get the gravity suit to get the power bombs, or get the power bombs to get the gravity suit. Also, I agree that the zeta metroids should spit/shoot/throw acid rather than fireballs. One other question. Since in this version of the game the different beams stack like in the other games, what are you doing with the big tower that contains all four beams in four consecutive rooms? In most of the metroid games, Samus is a walking tank by the end anyways, so there isn't much you can do other than make enemies who deal more damage or have non-destructible obstacles such as lave spouts, spiked floors, falling cave objects, rooms with lethal gases, and the such. One thing that you could do to make the area harder is make it super dark. The only sources of light you could produce would a small aura around samus and the shots from her beams (maybe limit which beam combinations can actually produce light because the Spazer would make it pointless). I think that would be totally fun and practical. Since Samus is so far down into the caves of SR388 by this point, shouldn't light be almost non-existent? You know maybe, traveling through the dark could be the obstacle. You could even add a power-up or something near the very very end of the game that allows you to see in the dark, Like a night vision visor (which for our purposes shouldn't be green light) which could function similar to the X-ray visor in terms of lighting; more of an Arc shape. This of course could be done in countless ways. For instance it could be a "stop and angle" variation like the Super Metroid X-Ray Visor, or an arm directed light (as samus looks in the direction she aims at); basically light that shoots from her visor while not forcing samus to be stationary doing it. I know for a fact that low lighting in a 2-D game such as Metroid = difficult but not impossible gameplay. Having samus loose her abilities is not all that practical really by this stage in the game unless your going to do it like they did in Zero Mission, but I don't think that situation really fits in this game environment. I hope you consider this suggestion and again good luck on the project. If you want, I have an idea for a gag weapon that people would probably get a kick out of. It would be for people who'd already beaten the game once. I call it,"The Inflato-Cannon" You jump recklessly towards a Metroid, activate the cannon at the last possible second, and watch the creature get blown up like a balloon until it pops! The "beam shots emitting light" is even canonical since you could do this with the Wave beam in Metroid Prime, so much so that you could use it to navigate dark areas without using the thermal visor. awesome work. there are many fans out there who are very pleased with your progress, doc. keep it up. another demo soon, perhaps?? Make sure to include the mystical quest for the Wood Beam. Using the wavebeam to light up rooms in Metroid Prime is not the most efficient way to navigate. It only provides so much light, and for that fact, a purplish glow which is a color that generally doesn't provide very good visual lighting to see things with clearly as it is fairly dark. Colors that generally do provide better night vision are Green and Red lights. But beyond that reference, you are generally correct about using beam weapons to see in the dark. But overall, is that really the only source of light you want? I vote the old grab a light box and carry it with you trick like you do in "New Super Mario Bros.wii". what if he chozo built the tower area where the secret is going to as a test? if you have the feature to turn off abilities, how about trying to make puzzle rooms that force off certain abilities once you go in and as long as your in them. that way you dont lose the power and you can keep the difficulty up and keep samus from tanking through. you wont have to re earn them and you can test your self when playing. and when you leave you turn them on again. You wont have to regain abilities that way. The game looks perfect, better than anything nintendo could put out there. Excellent work, it's looking really good, and it's really hard to believe that you've made this almost entirely in GM7. Hats off to you! One idea for the new area is have a small part of it be the remains of an outpost used by the Galactic Federation team that went to SR388 before the start of the game's story. Another is maybe have some sort of easter egg referencing Metroid Prime. There doesn't have to be any phaazon, maybe just a picture showing a meteor hitting a planet or something like that. Please, Please keep the music you've used so far in the final game. Especially the last demo! I love the way this looks, even though I have only been following it for a few weeks at most. I have a suggestion. Maybe, because someone said something about a therizinosaur type Queen, you could keep the original Queen design, but then after you kill it, it freaks out and blasts the room apart, and you fall down a long way. Once you reach the bottom, the queen has evolved super quickly, and turned into a King Metroid, or something named less cliché. It could look like a therizinosaur, with plating instead of the feathers, or whatever that is, I can't see it on Wikipedia. This one could be large, and move around slowly. It could spray acid out of it's mouth, and slice like the Omega in Metroid Fusion. Why don't you just make your new level a submerged one and move the Gravity Suit there? Make the item necessary. I really like that idea, but i think the game is not going change the story from the original. The progress looks great! I can't wait for this project to be finished. Its on my list of top fan-games I'm eager to play, up there with Black Mesa (HL2 mod, true remake of Half-Life) and Metroid: SR388. ... Speaking of Metroid: SR388, does anybody know what happened to that project? It seems the game's entire existence has fallen off the face of the earth, with the site completely gone, and nothing to find except for a few sparse, outdated Youtube videos and nobody from the project to contact. Is MSR388 dead? Because it certainly seems so, and that's really disappointing. Sorry to get carried away with a near-entirely different project, I love this one a lot, its just I have no clue what happened to the other one. should be a prototype of the power one but it can melt ice and deal a great damage to ice enemies, and you should change the name of the hyper suit because it have nothing of hyper. and maybe the doc should put also the thing of the spider ball. Been following this blog for a while gotta say I'm really looking forward to this. Metroid 2 is still one of my all time favorites from the series. Keep up the great work! That's the latest news from SR388 posted on 9/23/09. He has also made a few posts afterwords that seem to point towards them still working on it as recently as last month. Sorry to be off-topic, but I just wanted to give an answer to SR388 fans who have less powerful google-fu than me. "We want to keep the game a secret at the moment. We are working on the game underground and thus don't want any publicity at the moment. Thank you for your concern." That is the reply I got on Youtube. That reply was 3 weeks ago btw. How many Metroids in total did you decide on? 39? The more, the better in my opinion. My true belief is that MetroidSR388 is dead. honestly why would you take a publicly known Fan Game that has been all over you tube and make it all of a sudden a secret. Give me a break i had been following the forums on the site when it was still open and Von rictor or whatever his name was went on a hiatus and the site both home page and forums were up and then down(closed) and then back up and then closed again. And then earlier this year sometime some new person comes on claiming that von Richtor died in some horrendous accident and that this new guy was taking over the project and then the site was open again. The whole thing sounded bogus, he even had the same attitude in his blogs as Von Richtor, would act just like how Von Richtor would be. and then just as mysterious as this guy appears, the site closes down again. Give me a break. The Project is a failure. What had been done in the project was amazing especially considering all of the added directX effects (Power bomb, underwater effects, etc.) see you tube for visuals. But to pull it off the web so nobody sees it when it has already been seen to make it a Secret, Bogus. Sorry to go off like this. But we deserve the truth and to not be led on. Settle down boy. If you bark too much, you'll wake the real bears! Well that didn't turn out quite the way I'd hoped. En este foro muchas de las opiniones de los usuarios son simplemente ignoradas, es una lástima que luego de ver todo eso el dueño se de la molestia de decir "cualquier sugestión haganmela saber, por favor"
No creo que ignore los comentarios, simplemente escoje aquellas ideas que el cree mejores, pero no por ello se van a dejar de escribir, si nadie escribe sus ideas no podra coger ninguna :S.
Hay cosas que dice la gente que podrian llegar a estar bastante bien, pero se alejarian demasiado de la idea central del proyecto. Dang,this game looks GREAT!!! You're doing an awesome job making this remake! Can't wait for the official release of the game, keep up the good work! I replayed your demo today again. I know you said that you are pretty much finished with the physics, but there are some things I would like to point out to you. When you have the regular jump (not high jump)and you don't jump the maximum possible height, I think the gravity is a bit harsh. Samus gets slowed down a little too quickly as she ends her jump and starts to fall. Also, on the high jump, I think Samus is proppeled upward too quickly. This tends to make Samus feel hard to control. Anyway, I'm not even sure if you understood what I said, and I know that changing the engine would be a pain. Still, I think the high jump feels a little too powerful and makes Samus difficult to control. Good luck with the project. The jumping physics is based on Zero Mission's physics. ¿A cuales cosas te refieres al decir que se alejarían del proyecto mismo? Estos tipos quieren hacer una secuencia de escape en el encuentro de la Larva Metroid y Samus, ¿no crees que eso si rompería con la idea central del juego mismo? yo he leido muchisimo de la saga Metroid, y puedo decirles más de lo que cualquiera aquí presume, me da lástima que el proyecto se esté desperdiciando en ideas que destruyen el verdadero sentido que el creador del juego de Nintendo intentaba entregar. This post has become self-aware and homicidal. This post has been destroyed by the previous post. I know it sounds stupid, but Metroid SR388 is not dead. There really is no reason to make such a hugley anticipated fangame a secret, at this point, but I dont believe its dead. It will be released sooner or later. For the last area, I would suggest a flashlight system if it's going to be real dark, not sure about Night Vision or IR Mode. Great idea playerman1230, that would be an awesome addition, go for it doc. I have an even better idea. Not that your music, doc, is going to be bad, I've liked it so far. But I've always wished you can change the ingame music to whatever you want. I used to the that with Quake on PC. The Music was all on CD and loaded by track not by name. so you just put in what ever CD you want and it will play by track number. But in our case here we would use mp3's instead of CDs. then as you descend, gets darker and darker (http://www.youtube.com/watch?v=yzPybCt48Ro&feature=related). Doc, visually, your remake looks amazing. I have faith your audio will be up to par as well. Hey Doc, if you need help in the audio departmetn, give me a shot. Hey Doc, in case you didn't know, you've been spotlit by Gamepro. So, you make it to the Queen, and you give it all you got with missiles and super missiles: they bounce right off! Out of desperation, you use ice beam, and while it does very little damage to the queen, it is very irritating (cold :P). You manage to escape with the queen still alive. In an area near where you start, there is a tunnel that you didn't have access to because you didn't have the necessary upgrades. Walls in layers that can only be destroyed with bombs, powerbombs, screw attack, various beams, etc. block you way. But, if you get inside, you are greeted by, lets say TWO METROIDS!! OMFG!!1! Which kind you choose is up to you. Once you defeat them, you find Ice Missiles (or some new weapon) that equips you to stand a slim chance against the queen. Since one way to defeat the queen is from her stomach, how about ice bombs as a hidden power up? I bet you could think of a few cool morph ball puzzles that way like cooling magma blocks, or stopping a thermal vent that would have pushed you upwards with its incredible air friction. Of course, it shouldn't be necessary to defeat the queen. Just able to make it a bit easier as a way to reward explorers of your game. Just the idea of Ice Bombs makes me want the sliding physics from Metroid: SR388. it's a little late to be adding last minute stuff now. it'll be cool for another game tho. mmm aumentar la dificultad a cambio de pasar a un consiguiente sector podría descondinar la secuencia que tiene el juego, imaginemos logras acceder a varios sectores sin haber destruido a los metroid necesarios, siguiendo tu idea, te significaria mayor dificultad, y mayor cantidad de metroids. Lo siento no le hayo sentido a esa idea, solo altera la secuencia de las cosas, y hasta puede significar Ping para el juego por la cantidad de boss en la misma pantalla. Please post something random Doctor M64, It would really make my day. exellent¡ good work.. this game is great i love metroid.. ances hope with this game. When will the full version? la verdad que muy bueno el proyecto me gusta la musica los efectos, movimientos,graficos, escenarios, etc lo que si la presentacion habria que reber un poco mas el demo me dejo loco no puedo esperar a que salga la version terminada y por el nombre me gusto segunda mision ya que es una saga que espero que nunca termine! saludos y felicitaciones por el trabajo!